Three Of Pentacles: “They work together as one, creating a human ladder and climbing upon each other’s shoulders. With their combined height, they reach upwards, they yearn towards the sky. Into the stone wall, she inscribes her pentacles and her circles. They form a chain of overlapping arcs, like her interlinked relationships: circled sets of inclusion and combination. It is a mathematical equation of human relationships and interactions. Each arc is inscribed with care, as if they follow a blueprint. Her fingers trail through the stone as easily as if the surface were malleable clay. The solid stone gives way under the soft flesh of her fingertips. Such is the power of their combined wills that what is ‘impossible’ suddenly becomes easy, mundane, achievable. They comprehend the power of unity when one works in conjunction with others. As November comes to a close and the holiday season looms ahead we may find ourselves stretched too thin. Everyone has responsibilities, and when we add the extra expense, time and effort that goes into the coming month, it can be very overwhelming. 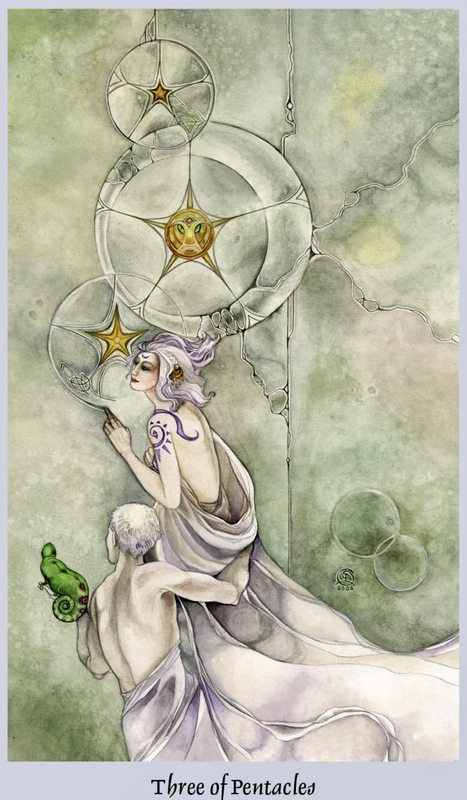 The Three Of Pentacles is a reminder that you are never alone. That you must ask for help and that when you do, that help will appear. You may ask it from family or friends, coworkers or peers, or you may ask it from your guides and the Universe itself. But you must ask. You must admit that you can do the impossible with a helping hand. You can move the mountains with a little assistance. It’s ok to admit that you need help. There is an element of unwavering support here too; someone who comes in and really cares to help you. Someone who lifts you up, who contributes something important. Wise words, encouragement, a receptive ear, maybe even an opportunity is on offer. Decide right now that you are willing to receive it. That you will allow someone to come in and give of themselves to you. That you will welcome it with open arms. Open your heart to the support that you need in order to move forward and build something new.